I recently had the opportunity to discuss the inspiration behind Fintentional and my passion for helping others with financial planning in Twenty Over Ten’s Advisor Showcase. You can read the full interview. Here is a little more about the name, theme and story behind the quotes and pictures. I read a book in the mid-nineties titled “Your Money or Your Life.” The book introduced me to the concept of “being conscious” of how you use your financial resources. I also had the opportunity to work with many high net worth individuals who fit the “The Millionaire Next Door” profile. These individuals consciously set out to build a business, career, or practice and wanted their investments managed with a similar mindset. My wife Amy and I are avid runners and yoga practitioners. We have an excellent running coach and wonderful yoga teachers who stress the importance of knowing why you were running that day or setting your intention before a yoga practice. I wanted my company name to integrate finance with consciousness and intention. I want my firm to focus on helping people consciously integrate money with their life goals however that might look for each person. I considered numerous names and nothing was quite right. Then one day “Fintentional” popped in my head during a run. I came home, found out that the domain name was available, and haven’t looked back. Twenty Over Ten helped me develop my web site. One of the questions on their questionnaire asked me to define my company’s overall style or aesthetic. More specifically it asked me to think about what my office space looks like, images you use on brochures and artwork on the walls. This question stumped me for a bit since my goal was to establish more of a virtual practice. I work out of my home and can accommodate seeing local clients. So, I thought about my home and my office space. Many people, when visiting our home, often comment on how welcoming it feels. My wife and I love to travel, so we have printed some of Amy’s pictures on canvas and placed them throughout the house. My goal was to try to have the overall aesthetic of my website feel welcoming like my home while also conveying the message of “Finance with Intention.” I wanted to show that I am passionate about personal finance, understand that I am helping clients with their hard-earned financial resources, and have the experience and knowledge to help them. The selected quotes and pictures are very important to me. The quotes helped me develop the overall style. I want to convey my personality, views on money, and my long-term investment philosophy. I also tried to select quotes from individuals who might not always be lumped together like Henry David Thoreau and Ayn Rand, but had interesting views on wealth, money, and life that fit together. I included my wife’s vacation photos behind each quote to further craft the overall look and feel. My wife’s only stipulation was to include some Michigan photographs since not everyone realizes how beautiful Michigan is. The Michigan pictures include waterfalls from Michigan’s Upper Peninsula, rocks leading into Lake Michigan from Old Mission Peninsula near Traverse City and Fort Mackinac, a historic fort originally built by the British located on Mackinac Island. The grizzly bear, humpback whale and glacier pictures are from our trip to Alaska that included visits to Glacier Bay and Denali National Parks. The Cinque Terre picture shows where we stayed in the city of Riomaggiore during our travels through Italy. And finally, the washed up driftwood picture is from the beautiful beaches of Cat Island, one of the out islands in the Bahamas where we visit to escape the Michigan winters. I hope that you enjoyed learning a bit about Fintentional and the thought that went into the development of the web site. I look forward to being of service to you and learning about the interesting places you may have visited in your travels. 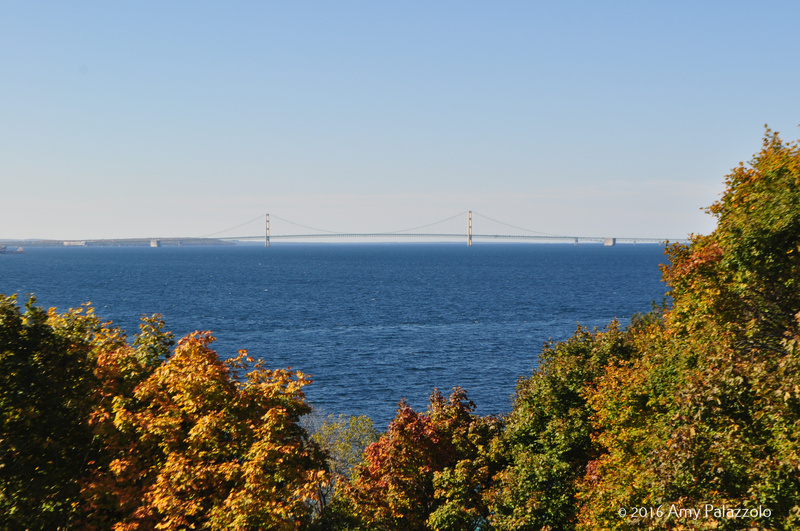 Finally, I would be remiss if I did not highlight the above picture of the Mackinac Bridge that connects Michigan’s Upper and Lower Peninsula’s taken from Mackinac Island.